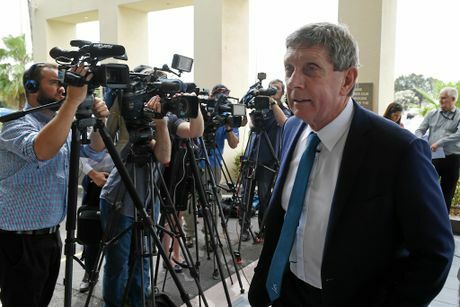 Cronulla CEO Lyall Gorman has suggested Ben Barba may have gotten carried away in the club's premiership celebrations, after the Sharks fullback tested positive for cocaine use four days after their grand final victory. The 27-year-old has been released from his contract with the club and has entered a rehabilitation clinic in Thailand. Gorman told media Barba may have been swept up in the occasion and made a poor decision, but would be supported by the club. "Whether he's got carried away with the celebrations ... I don't know the exact circumstances of when this occurred, but it's obviously a poor choice,” he said. It was Barba's second positive drugs sample, after he failed a test last year. He has been banned for 12 games by the NRL, should he return to the competition in the future. In a statement released by the Sharks, Barba said he was hopeful of one day returning to the club. Gorman admitted he was saddened by Barba's departure and paid tribute to the contribution he had made to the club. "This is an incredibly difficult situation for Ben, his family and our club, and all involved with it,” Gorman said. "Ben has made a remarkable contribution to our club and community since joining it. It is, however, something we believe and accept is absolutely necessary in order to assist Ben to work through the challenges at hand. Gorman said no other players from the club had failed a drugs test. Barba, who played 97 games for the Bulldogs after debuting in 2008, joined the Sharks at the start of last season following an ill-fated spell with the Broncos in 2014. He won the Dally M Medal in 2012 but was stood down by the Bulldogs before the start of the 2013 season after struggling with off-field issues reportedly involving alcohol, gambling and a relationship breakdown. He returned in round four that year but was released from the last two years of his contract with Canterbury at the end of that season. With Barba at fullback, the Sharks last month broke a 49-year wait for their first premiership by beating the Melbourne Storm 14-12.